If you search your ancestors in Anzi, Basilicata, info about your Italian family are stored in the City Office archives or at the parishes. In towns and villages of Basilicata and in Potenza province registry offices were established in early 1800: it means that you could find information in Anzi registrar as of that date. So, if your ancestors were in Anzi in the nineteenth or twentieth century, then you could try to contact the City Office of Anzi to know more. Before to start your genealogy research in Anzi, we suggest you to read our tips for your search . They are useful to search in Basilicata and in Anzi too. 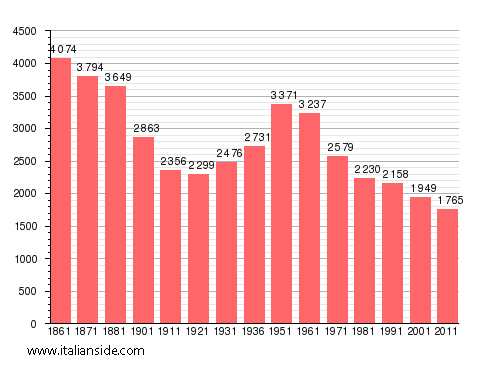 Next picture shows the demographic trends in Anzi from the Italian Unification (1861) an important info to understand how many people lived there in the past. It could be important to know if the last name you are investigating is a frequent surname in Anzi. As more your surname is common in Anzi, as more it could be difficult to find the right info about your ancestors in Anzi archives if you have not exact dates. If you have the opportunity to visit Anzi and Potenza province, you could plan to investigate churches’ archives by yourself, but from abroad is very difficult to obtain any result unless you find a reliable local help. If your research is in a dead end and you need professional help from our local Italian genealogists write to anzi@italianside.com our expert in Anzi area will study your request and will reply to you with a research plan and a quote. I am looking for information regarding my great grandfather, Saverio Napolitan0, born 1877 (possibly July), immigrated to the US from Naples in 1901. Records are showing that he was born and/or lived in Anzi and would like to know if you have any information regarding him and/or his family. I am a descendant of Pasquale Esposito and Mary Theresa Martini (spelled more contemporarally as Martine). They emigrated to the U.S. around 1900 and lived in Hazleton, PA.
Mary Theresa Martini was born in Anzi in 1877 to Rocco and Grace (Grazia) Martini. Grazia’s maiden name was possibly Cerrone/Cerone. Mary Theresa had three known siblings: Joseph, Michael, and Carmela. Each emigrated to the U.S. and similarly situated in Hazleton, PA and had extensive families. The Matteo and Rubertone families, also from Anzi, married with members of the Martini family both back in Anzi and once settled in Hazleton. Gerardo Matteo and Angela Marie Rubertone (b.1854) are the oldest known connections. Pasquale Esposito was born in 1871 to Sabato and Grace Esposito. My grandfather, their last living child, describes the town of origin as being in the valley below Anzi and known then as Dominos or similar. I cannot find anything on current maps matching that closely. Pasquale is believed to have had siblings but nothing is known about them. I’ve exhausted all known documents available to me through family and popular domestic genealogy sources. Any guidance as to additional sources by which to continue my research would be greatly appreciated. Hoping for birth and/or Baptism record for Francisco REGILIO, b. 13 FEB 1897 • Anzi, Potenza, Basilicata, Italy. Francisco/Frank is deceased in USA. Thank you. Looking for information on my great grandfather Luciano Martocci(o). Born in Anzi and immigrated to the USA in the late 1800s or early 1900s. I have seen some documents that say he was from Strada Taverna, Anzi. I will be visiting Anzi this May and would love to find out more before I get there. I’m looking for information on my great grandfather. his name was James Motula/Motola/Mott/Motley. He was married to Catherine and they had a son Donato Mott and lived in Hazleton PA. Donato’s records say he was born in Anzi Italy in 1891 of 1892. Catherine and James came to the US separately in 1893 and 1894. They were married in Italy in 1888. I’m not sure of exact names as it seems that they changed them to be more anglo. Seems like Hazelton was a popular place to settle for those from Anzi. I’d appreciate any info you can provide. Trying to surprise my dad for his 90th birthday. I am searching for information on the Calabresi side of my family. In 1946, my grandmother in Hazleton Pennsylvania, the widow of Rocco Scatton(e), received a letter from Andonietta Castrignano, the daughter of Giuseppe. She was living at the time at Via Angioporto 30, Anzi. She was evidentally that Rocco (son of Francesco Paolo and Angela Castrignano) had been dead since 1930. As far as I know, the letter went unanswered, and was found among the effects of my uncle Frank Scatton after he passed away several years ago. Antonietta refers to an Uncle Dominic, who I take to be Angela’s brother, who also emigrated to Hazleton Pennsylvania. He was married to an Angelina Lobraico. I would be grateful for any information about Antonietta and her family, particularly if any descendants of her father’s family line are still living in Anzi. My name is anthony esposito. My fathers name was anthony also. His fathers name was giovanni and mothers was rose. Children were donata(anna), carmella( millie), mary, josephine, rocco(rex), michael, salvadore, and anthony. There were other half brothers and sisters too. I believe there were several marriages.Does anyone have any info on this family. Trying to find information about Joseph (Giuseppe) Lauria Calabrese, born in Anzi in 1869. He married Antoinette Fanelli (from Laurenzana). His father was Rafael Calabrese and his mother was Maria Irene Lauria. We are hoping to spend a day in Anzi in early July this year and would love to meet up with someone who could introduce us to a cousin or tell us information about where he may have lived. Hello, My Grandfather Angelo Raffaele(i believe that was the spelling)was born in Anzi, Italy (1901) and came to America in 1902. His Father Michele (here in America they called him Michael) was born 1876 and passed 1945 in Hammonton, NJ. His wife Maria Tortorelli was born 1884 and pass 1958 also in Hammonton, NJ. My grandfather had 2 sisters Mildred (1914-2005) and Marie (don’t have much info on her) and 1 Brother Anthony Benedetto (1912-1938) I have some info from ancestry saying my grandfathers father name is Angelo R Benedetto (1840-1917)and Mother name is Angela Rosa Castrignano. I’m not sure if it’s true or not. Hoping anyone here can help. Trying to find out information on my grandfather, Dominic Castrignano, born in Anzi 1870. Not sure when he came to the US, but eventually settled in Hazleton Pennsylvania. He died in 1926. Another early spelling of his name was Castriguano (1910 census). By 1930 the name became Castrina. My Father’s Aunt, Caroline Belletieri married a Frank Csstrignano my guess is around the turn of the 20th Century. Caroline’s father was born in Hazelton. They all were last in the Wilkes-Barre area. I am searching for the Belletieri’s to locate my Great-Great Grandfather who had a son named Rocco. 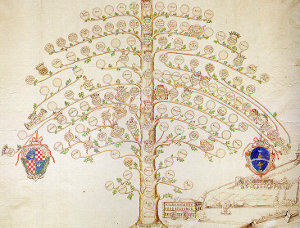 It seems that the family originated in Anzi, Potenza, Basilicata. I VISITED ANZI IN 1980 AND VISITED AN OLDER LADY NAMED CATHERINE BELLETIERI. MY AUNT AND I WERE LOOKING FOR RELATIVES OF THE LYATE FAMILY FROM HAZLETON. IT IS AN INCORRECT SPELLING. MY GRANDMOTHER WAS BORN IN ANZI AS WELL AS HER YOUNGER BROTHER, ROCCO. SHE WAS 15 WHEN HER FATHER, STEPMOTHER AND BROTHER EMIGRATED. WE FOUND SOME RELATIVES BUT UNFORTUNATELY HAVE LOST TOUCH BECAUSE OF DEATHS.THE BELLETIERI WOMAN WAS RELATED TO A WOMAN WHO LIVED ON HAYES ST. IN HAZLETON. I HAVE LETTERS THAT WERE SENT TO ME BUT I’M NOT SURE WHERE THEY ARE. MY GRANDFATHER WAS BORN IN PATERNO WHICH IS NOT FAR FROM ANZI. HIS NAME WAS MICHELE (MICHAEL) FORTUNATO. ALL OF US BECAME “FERDINAND” AND I STILL DON’T UNDERSTAND WHY. Michael — It’s a year later you’re probably not seeing this, but we’re probably related. My great-grandfather was Rocco Bellettiere (the spelling changed at some point in the US). His father’s name was Santanno Bellettieri, who was born in Anzi in 1878, came to the US with his father Giovanni as a 14-year-old in 1892, eventually went back to Anzi and married Maria Di Joia (sp?) in 1902, then returned to America. lived in Hazelton.His children were born in the 1870’s and on, he may have been born in the early 1850’s. He had 3 sons James,Anthony and Michael(my grandfather) and 5 daughters Caroline (Castrignano) Rose (Trabaugh) Millie (Nuncio/Legree) Elizabeth (Carengi) Mary ( DelBalso). Basically it is an open ended project. We could be related but it may be connected back in the early 1800’s in Italy. Santanno and Maria Di Ioio are our grandparents! Great that you gave all of these details! My grandparents were from Anzi, my grandfather name was Egidio Marino born 1883, my grandmother name was Maria Tortorella Marino. They were married there also. I would so appreciate any information that you could provide. If you would like to start a research in Anzi please send your request to anzi@italianside.com.